Racks, mezzanines, staircases, walkways and storage shelves in material handling facilities have edges. Preventing people, boxes, pallets, tools, materials and packaging from falling off these edges onto the floor below is edge protection’s goal. Mezzanines maximize facilities’ cubic space. Falls of people and objects are a concern in these elevated work areas with the risk of harm extending to people on the floor underneath. 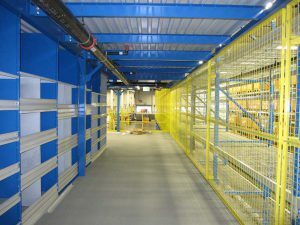 Fixed guardrails often are installed around mezzanine perimeters, but guardrail openings are commonly required so employees can load and unload palletized material via lift truck, said Aaron Conway of MHI member Mezzanine Safeti-Gates, Inc. That involves repetitive motions like lifting heavy, cumbersome items, so unguarded edges can lead to falls. “With a safety device in place, especially one that is permanent and does not require an often-tired employee to think about taking an additional step to make an area safe, the mezzanine edge is protected,” Conway said.